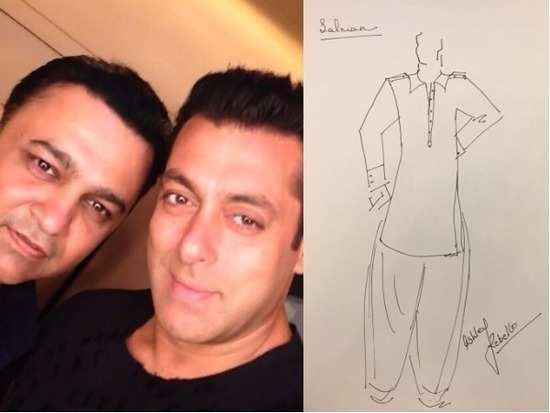 HomeFashionAce designer Ashley Rebello designs an outfit for Salman Khan this Eid! Ace designer Ashley Rebello designs an outfit for Salman Khan this Eid! Eid is finally upon us. The festival of peace and prosperity has finally arrived and we couldn't be happier about it. We all know just how much this occasion means to the bhai of Bollywood aka superstar Salman Khan. Every year, not only does Eid mark the release of his films, Salman also throws lavish parties for his family and friends to celebrate the festival with the success of yet another blockbuster. Now, this year seems to be all the more special as Salman Khan will also be attaching the trailer of 'Loveratri', which features his brother-in-law Aayush Sharma, along with his this year’s Eid release – 'Race 3'. Now this special occasion certainly calls for a special outfit as well. Salman’s designer – Ashley Rebello has ensured everyone that the superstar will have a stunning outfit for the event. The ace designer has created a lovely all-white traditional ensemble for Salman for his Eid party this year. Talking about the ensemble, Ashley said, “Salman likes his clothes to be simple and without any fuss. So, this year for his Eid ensemble I have used Chikankari work fabric for his Pathani. The outfit will be not only stylish but also extremely comfortable, just the way he prefers.” Well, we can hardly wait to see how his attire turns out. Stay tuned for more updates. Priyanka Chopra just styled one top in 2 crazily different ways and no one even noticed! Priyanka Chopra's Jacquemus skirt is headline news itself! Kylie Jenner and Kim Kardashian West look like twins in matching skintight leggings! Did you'll notice how perfectly Anushka Sharma and Virat Kohli complemented each other's athleisure style? All the details we're loving about Priyanka Chopra's latest look! This diamond-encrusted Hermes Birkin might break the record for the most money paid for a handbag! 'Dhadak' trailer launch: Janhvi Kapoor and Ishaan Khatter look picture perfect! 1Ace designer Ashley Rebello designs an outfit for Salman Khan this Eid! 2Priyanka Chopra just styled one top in 2 crazily different ways and no one even noticed! 3Priyanka Chopra's Jacquemus skirt is headline news itself! 4Kylie Jenner and Kim Kardashian West look like twins in matching skintight leggings! 5Did you'll notice how perfectly Anushka Sharma and Virat Kohli complemented each other's athleisure style? 6All the details we're loving about Priyanka Chopra's latest look! 8This diamond-encrusted Hermes Birkin might break the record for the most money paid for a handbag! 9'Dhadak' trailer launch: Janhvi Kapoor and Ishaan Khatter look picture perfect!